The most historically interesting street in Carbonear is Water Street. As you may have guessed from the name, it’s on the harbour. It’s where the town’s original mercantile stores were built. Some of those commercial buildings have been turned into restaurants. These days, whenever a new, locally owned restaurant opens in Newfoundland we should be grateful. To be honest, I experience a frisson of excitement when word of an opening gets dropped in my shell-like. 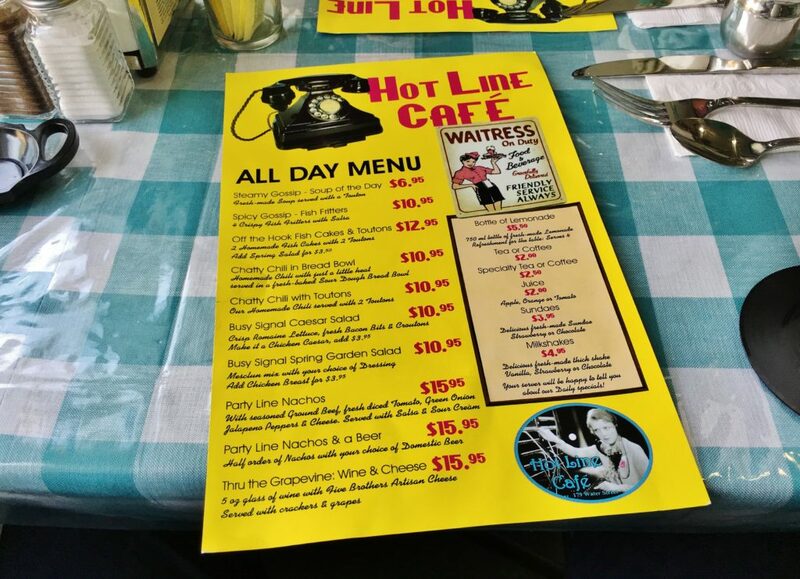 So, I tip my hat to Pauline Yetman and her five-week-old, Hot Line Café. 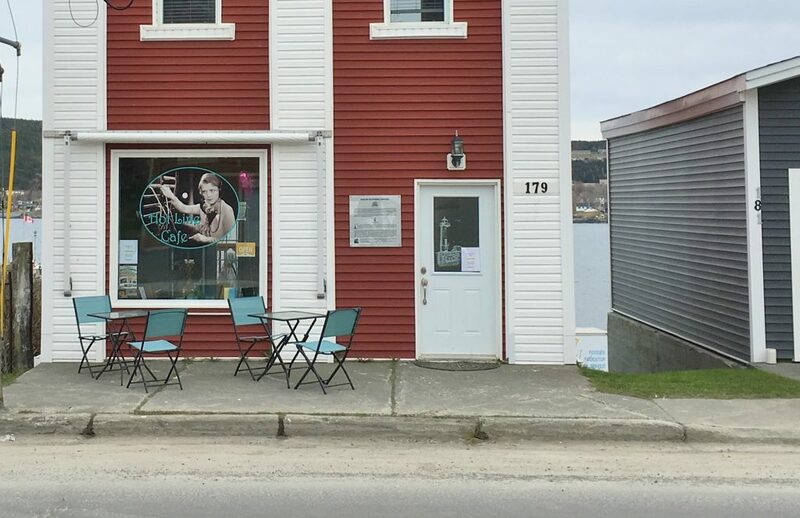 Hot Line Café occupies Carbonear’s old telephone exchange building. 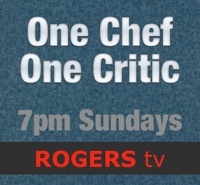 Given that bit of info, and the restaurant’s name, you’re probably imagining an eatery with a telephone or telecommunications theme, and, you’d be partly right. Hot Line’s front window features a large photo of a 1930s-telephone operator. Inside, there are replica vintage telephones, a working, authentic 1947 rotary dial phone, framed telephone company adverts and a plug cord switchboard that’s been sitting idle since the building shut in 1961. A prevailing theme is 1950s pop culture, with which, Pauline Yetman appears to be thoroughly fascinated. Everything about the décor speaks to that era. 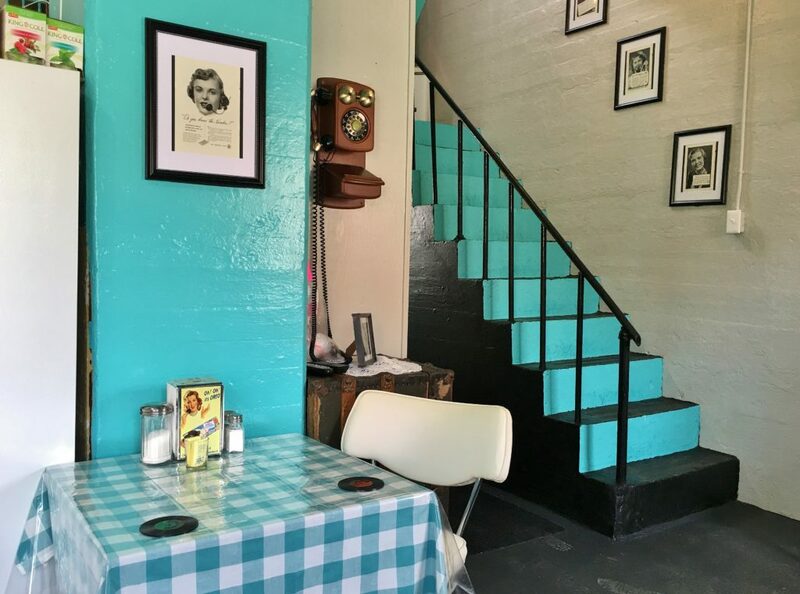 Guests are accommodated at chrome kitchen tables, set with diner style, stainless napkin dispensers, and drink coasters that look like 45 rpm records. Black and white publicity photos from 1950s TV shows like: I Love Lucy, Father Knows Best, American Bandstand, Car 54 Where are You, and others, are everywhere. If you’re over 60, which Yetman is not, your memory will be jogged. I need to tell you something about the building itself. Apart from the three occasions when Carbonear was deliberately burned to the ground by French soldiers, in the 17th and 18th centuries, a fourth, accidental burning happened in 1929. The latter fire was started by malfunctioning equipment at the first Carbonear telephone building, which was a wooden structure. In what I’d call an over-the-top future razed earth prevention strategy, the telephone company constructed a new exchange building completely out of poured concrete. Walls – all of which are exposed, save for a thick layer of battleship grey paint – appear to be of tomblike thickness. At least 16 inches. Thankfully, the building has windows and a pleasant, wooden outdoor deck overlooking the harbour. Otherwise, you might think you were dining in a wartime bunker. On a small budget, there’s very little that can be done to turn a concrete fort into a cozy café. It’s a fig leaf on an elephant. However, Pauline Yetman has done a commendable job of turning a stark, cold edifice into a space I’d call, mildly warm. Ultimately, what’s needed is for most of the exposed concrete to be covered with something soft, or soft in appearance. There’s a valid argument to be made for maintaining such historic, utilitarian buildings as originally designed, and I respect that viewpoint. In this case, however, I think the story of the telephone exchange can be effectively told without showing as much concrete. Much of what appeared on the luminous yellow, retro menu card, in hot red letters, was diner fare: soup, salads, chili, fish fritters, nachos, sundaes and milkshakes. We started with thin but flavour-rich soup and a touton: pea soup with root vegetables and bits of salt meat – which wasn’t salty at all. Isn’t salt meat’s saltiness the only reason for making salt meat these days? To be fair, salt and pepper shakers had been placed on every table, but adding salt after the fact doesn’t produce the same effect as having it cooked in the dish. Yetman’s toutons were curious. They looked a little like donuts, round with a hole in the centre. 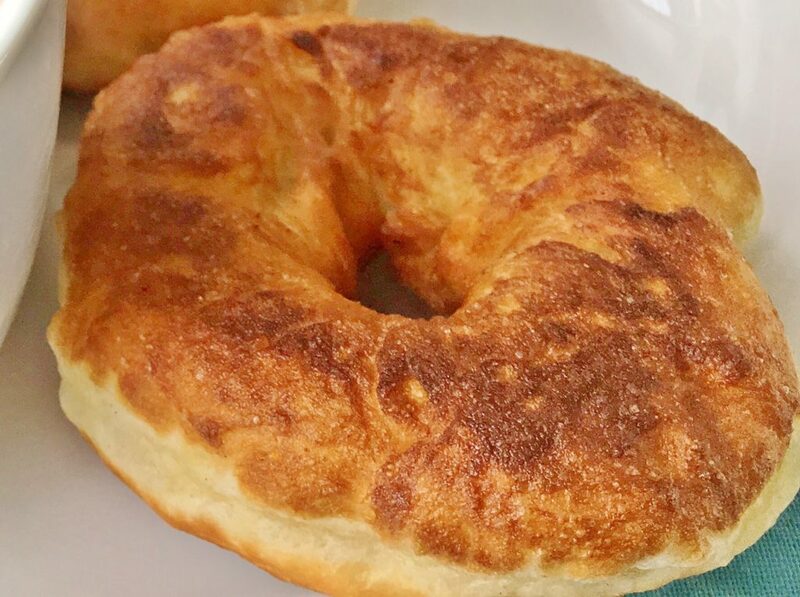 She told me that this is the way her mother made toutons, and, that Mom referred to cooking toutons as “making donuts.” I absolutely enjoyed them, but they’re as far from traditional Newfoundland toutons as a flapjack is from a crêpe. Although pan-fried, Hot Line’s toutons were airy and light, without the dense heft of a hockey puck touton. A good pour of molasses would have flattened them. 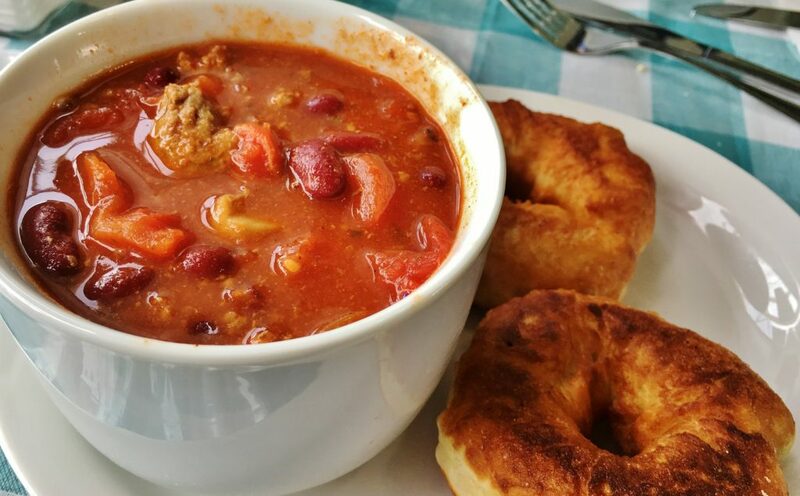 Hot Line’s chili with toutons looked great, but it was incomplete, like Elvis singing Blue Suede Shoes without the foot action. Lots of good things showed up in the stew: beef, beans, tomatoes, but it missed the developed flavours that come from spices, well browned meat, and being cooked longer. Chili should also be spicy hot, maybe not overwhelmingly hot, but noticeably so. That’s how it got its name, chili con carne: chili (pepper) with beef (carne). 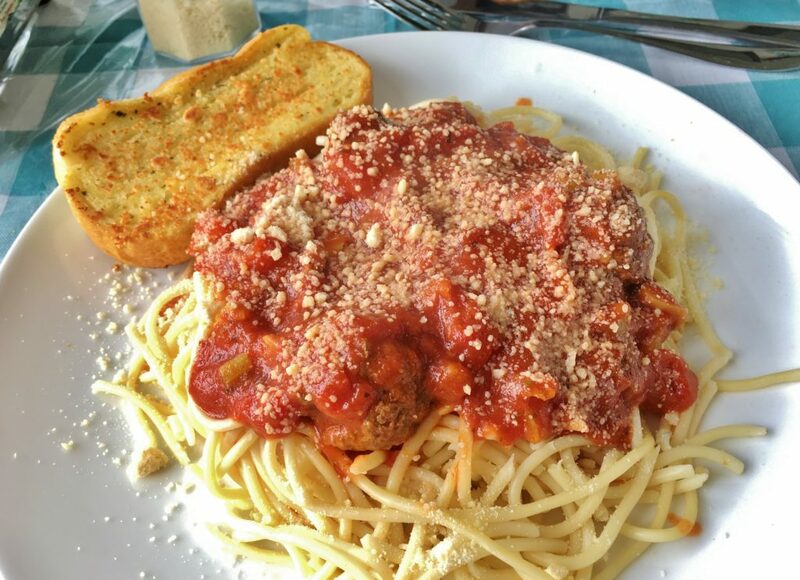 I had the special, spaghetti and meatballs, with a Caesar salad. Imagine the kind of Caesar salad you’d make at home on a weeknight, with those boxed croutons, and that’s pretty much Hot Line’s version. The spaghetti was flabby, i.e. a little overcooked, as would have been the case in most diners of the 1950s. But, do we have to cook it like it’s still the 1950s? The meatballs were smallish and fine. The sauce, much like the chili, was under seasoned and underdeveloped. It needed more onion, garlic, basil, oregano, parsley and, yes, salt. tasted every bit as good as I hoped it would. 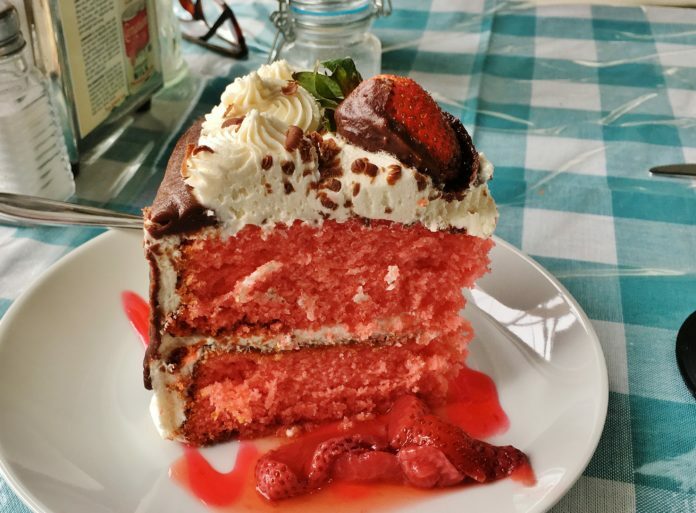 I’m rooting for Pauline Yetman and her Hot Line Café in Carbonear. Hot Line has lots of potential. It’ll be fun to revisit this summer to have a bite and a cool drink on Hot Line’s deck. I might even order the things I’ve mentioned, if those seasoning adjustments are made, but, as Bill Haley would say, Elvis needs to “shake, rattle and roll”. Price Lunch for two with tea, tip and tax costs approximately $50. Service Warm, welcoming and efficient. Atmosphere Although Hot Line Café is colourful and funky, patrons may find it difficult to overcome the feeling that they’re dining in some sort of World War II fortified shelter. Open Monday to Friday: 11 a.m. to 7 p.m. Saturday and Sunday: 10 a.m. to 12 p.m. for Hot Line’s breakfast menu, and, 12 p.m. to 7 p.m. for Hot Line’s main menu. Closed Mondays. Credit cards Cash and debit. Beverages Bottled homemade lemonade, milkshakes, tea, specialty tea, coffee, juice, water. A liquor licence is pending. Best bets Pea soup, toutons, chili and strawberry cake.